Modern and Japanese Style Design. Deck Design. Merging of nature, plantings and house entrance become apparent in this photo. Sitting on the low cedar wall near the azalea may bring on a quiet meditative experience with restorative qualities. Clean lines with simplified Japanese garden qualities exist. Lighting design adds special effects at night. Minimalist Design. 20 years later the plantings have matured and have transformed this space. 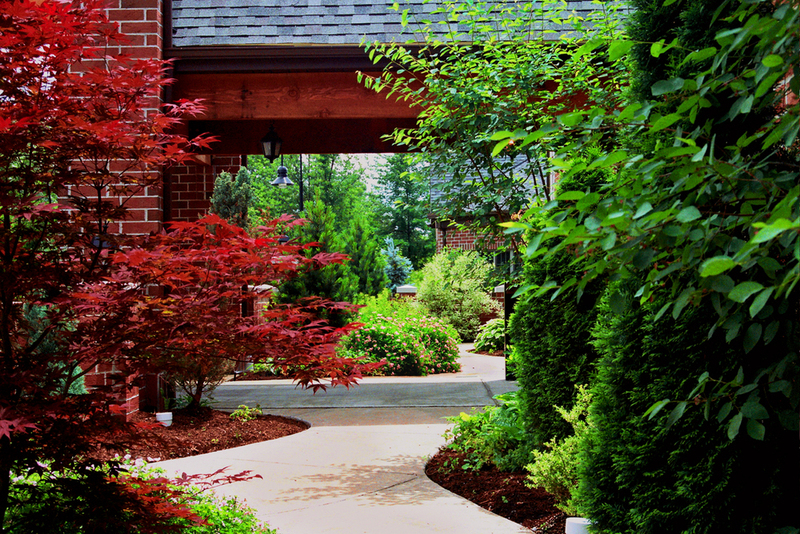 For various reasons, owners often feel the need to replace landscapes after a number of years. These plantings are in their prime after 20 years. The sculptural azalea, wood detailing, and architectural forms, create a sequence of experiences through the entrance court. A single large azalea adds just enough softened accent and sculptural qualities to the front entrance, while maintaining a feeling of simplicity. House designed by Fred S. Toguchi. Contemporary design, simple, clean lines. The azalea in the foreground, the Japanese maple in the background, and the clean wood detailing, subtly define an intimate experience upon entering the court space. This is just one of a number of sequential experiences throughout and around the entrance court. The overhanging branches of the azalea were specifically positioned over the deck for effect. Japanese garden qualities are noticeable. 20 years later the Japanese Maple arches over the small courtyard and deck like a translucent veil. House, landscape and woods meld together for a unified design. This photograph was taken 18 years after the landscape design was installed. Bird's eye view of the Entrance Garden. A few specimen plants carefully positioned to define a simple intimate court. The balanced spacing of the cedar bollard, the azalea in the foreground, and the specimen maple and low cedar wall in the background, creates and defines an intimate entrance court in a woodland setting. The space is subtly defined as noted, yet offers a quiet feeling of openness to the surrounding forest. The “voids” between the “objects” within a space are integral to the overall design and give “sculptural” form to the plants & bollard. Qualities of a meditation garden, a Zen garden, minimalist design, and Japanese style are present, with a touch of modern. This courtyard is an example of exterior space design on an intimate level. Contrast this style of design and scale with “The Belvedere” and “The Big Space” projects. The informal lushness, richness, and variety of plantings starts to take on an English Garden Style. 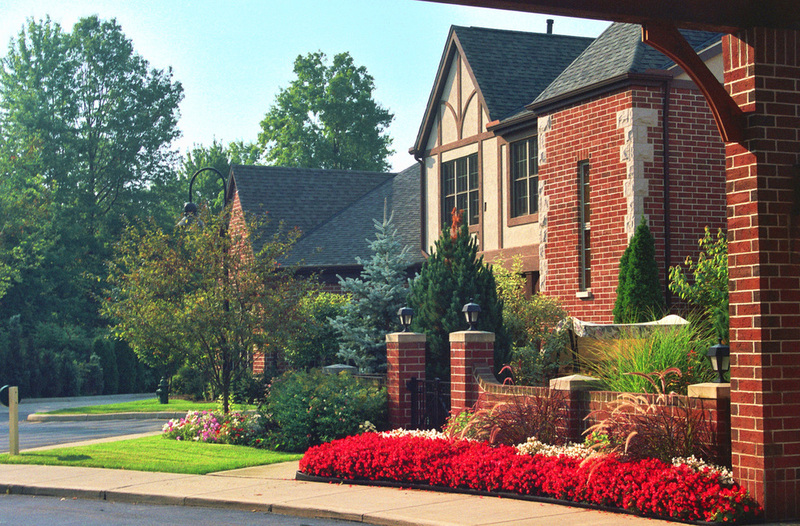 Despite the complexity, the landscaping blends well with the Tudor architecture and the setting. Each and every plant was chosen and strategically located to meld with the architecture and the overall rhythm of the space. The complexity of colors, textures, and shapes visually works well together and complements the architecture. The plantings are in scale with the building. The building does not visually appear to dwarf the plantings or vice-versa. They are well proportioned to one-another. Within this context, slower growing and smaller tree varieties were chosen. Plants were chosen for their natural form and size eliminating the “need” for “hedge” or “ball” trimming. The landscaping also offers seasonal variety throughout the year. The garden offers a sensory experience. The front annual bed is by the Belvedere Grounds which they change out every year. This courtyard has a very different style and feel from the Nemeth Residence shown elsewhere on this Page. The courtyard retains lushness and richness with different colors, textures, forms, and materials to stimulate the senses. Despite the complexity, everything within the courtyard fits and works well together. Despite the informal look, each and every plant and pathway was chosen and strategically located to meld with the overall rhythm of the space and architecture. The courtyard has a personal and “human” feel to it – a place where you might want to go for a quiet stroll, relax, and stop to take in the surroundings as a sensory experience. Many of the qualities described above characterize a healing garden or therapeutic garden. Contrast this space with “The Big Space” model shown elsewhere on this website. A colorful lush garden and courtyard embellish the English Tudor architecture. The inner stroll garden is a sensory experience. This project was built in 1999. In 2013 the owner removed some of the plantings shown in the above photos and replaced them with annuals. The new design offers a much more inviting entrance. The existing ornamental light pole and some existing background plants were incorporated into the landscape architectural design. Existing ornamental post lamp, new potted annuals, and new brick walk highlight the front entrance. Curving brick walk with interesting textural patterns. Frontyard and backyard design, including courtyard, patio, seatwall, water fountain, small reflecting pool, contemporary garden and planters. Modern design includes cedar seatwall, stone patio and path, and contemporary reflecting pool and contemporary spillway water feature. Schematic design and site planning for residential buildings, multiple uses, and sensitive natural areas. Site Plan includes schematic grading and drainage. Slope analysis and suitability study integrating human uses with a variable natural environment including existing steep western slopes, mixed wooded areas, natural swales, and a lower off-site stream.